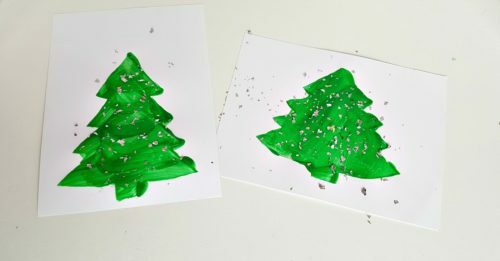 If you’re looking for an easy Christmas craft for toddlers then this Christmas tree stencil craft is ticking those boxes. 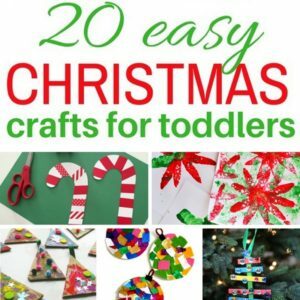 Toddlers can make a beautiful Christmas tree with a simple cardboard stencil. 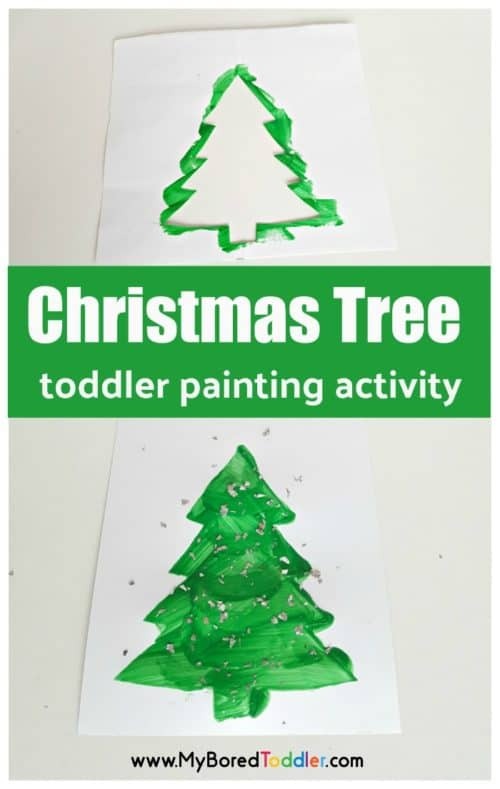 This activity is a fun way for creative kids to explore and to discover and have fun with some paint. I know that many parents of toddlers are scared to get out the paint, but I encourage you to DO IT! There are so many advantages to letting young children paint. 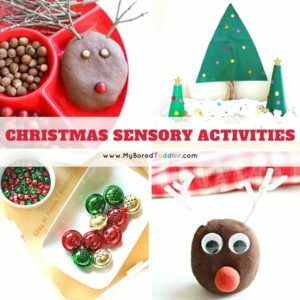 Painting activities promote the use of fine motor and creative skills, and the kids have so much fun dipping and dabbing and swirling with a paintbrush. If you’re a ‘we don’t paint at home’ family, I’m encouraging you to give painting a try! This stencil activity is easy to set up with just a template and some paint, but as with any painting activity it can get messy so you’ll want to prepare the area. Spread a drop cloth on the floor and table (I have one of these ones), and protect your child’s clothing with a paint shirt or paint apron. My favorite is this personalized paint apron. Paintbrushes. If you’re toddler has trouble holding a paint brushes, these thicker grip ones are great. 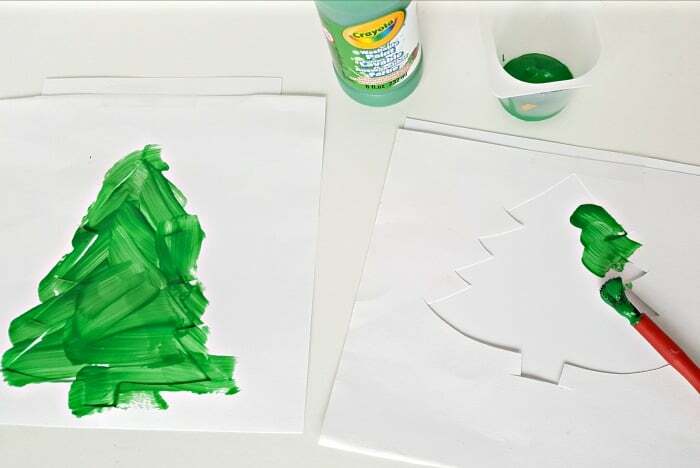 Make a Christmas tree stencil for your toddler by drawing the outline of one half of a tree on the folded edge of cardboard or cardstock. Heavier or thicker types of paper will allow the stencil to better withstand lots of paint! 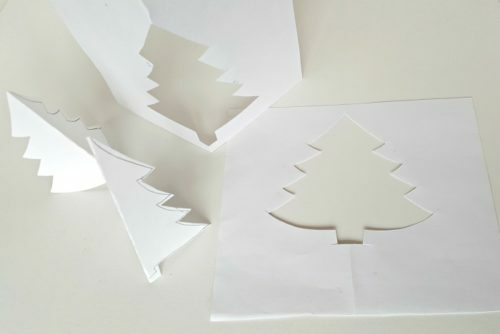 Cut out the half tree and unfold to reveal the stencil of the complete tree. These examples show how different each stencil can look, just by drawing the half tree a little taller, or a little wider. Place the stencil on a piece of paper and tape at the edges to secure. This will prevent the stencil from sliding around as your child paints. 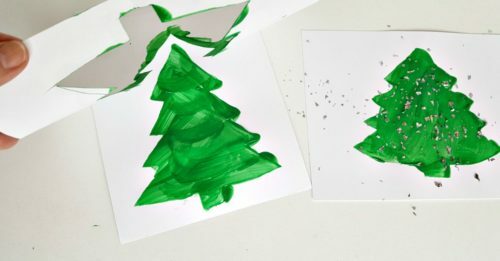 Your toddler can apply lots of paint to the stencil, both inside and out. In fact, if he covers the cut out opening and all the paper around it, the result will be a pleasant discovery when the stencil is lifted. 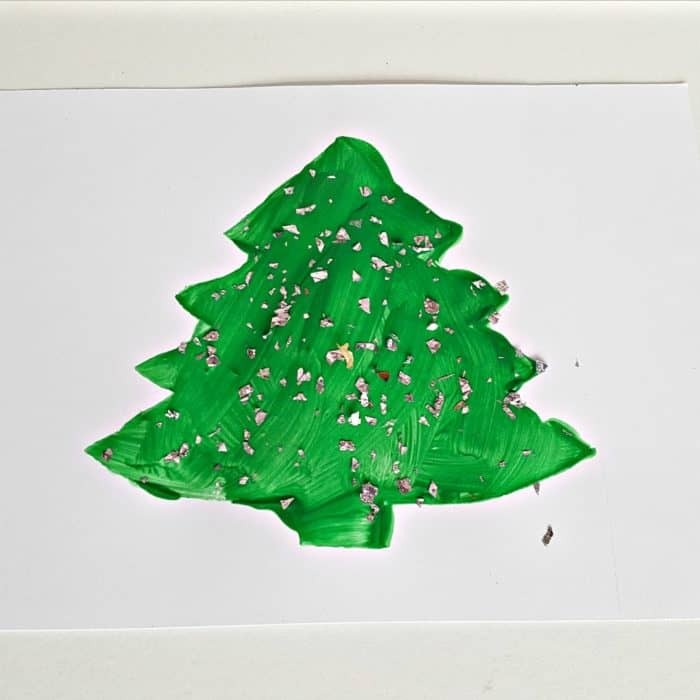 Enjoy the magical discovery of the painted Christmas tree when the stencil is lifted! 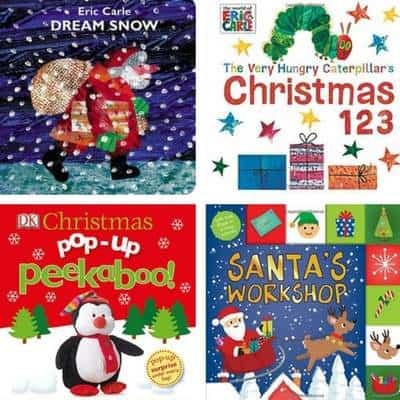 You can now sprinkle glitter on the wet paint and allow to dry for an added festive touch. Or simply use the tree as is for a beautiful decoration. A stencil is a great painting prompt, offering lots of options for color, paint stroke, and embellishments! Your young artist will love displaying his picture as a decoration for the home, or presenting as a special gift for Grandma or a favorite friend.